I seem to have perfumes coming out of my ears at the moment! Not that I’m complaining of course! 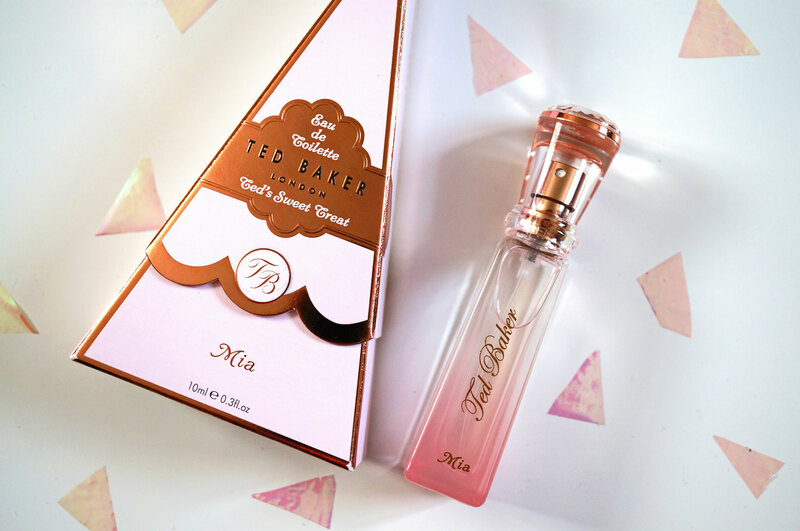 My newest scent is the lovely Mia by Ted Baker. Ted Baker to me has always been about clothes and bags. I’m completely in love with their current seasons collections and I’m lusting after pretty much everything. I must say that I had completely overlooked their fragrances though, and when I was sent this Mia EDT scent to try out, I was definitely pleasantly surprised! Soft floral scent blends delightful rose blooms with muguet and freesia. The Top Notes sparkle with fresh lemon, raspberry and blackcurrant, pomegranate and redcurrant rest upon a base of warm patchouli and golden amber. With a soft floral fragrance of rose blooms and freesias, Mia captures the spirit of a midsummer evening. Luscious top notes of fresh lemon, raspberry, and blackcurrant are combined with a seductive base of warm patchouli and golden amber, provides the perfect accompaniment to a flirtatious dress and fabulously floral accessories. Mia really is the scent of summer, in the perfect handbag friendly sized bottle! This little bottle has been travelling everywhere with me since it arrived! The scent is light enough for daytime, but also has a seductive element making it perfect for a summers evening, it also comes beautifully packaged in a triangular box so it would make a perfect gift! Oh and did I mention it’s only £15 too? What a bargain! This is the sort of perfume that anyone and everyone will love, I think I may have to stock up on some more bottles!! Previous Post BareMinerals NEW BareSkin Foundation & Blogger Event! Next Post Which Blogger Networks Can I Sign Up To?